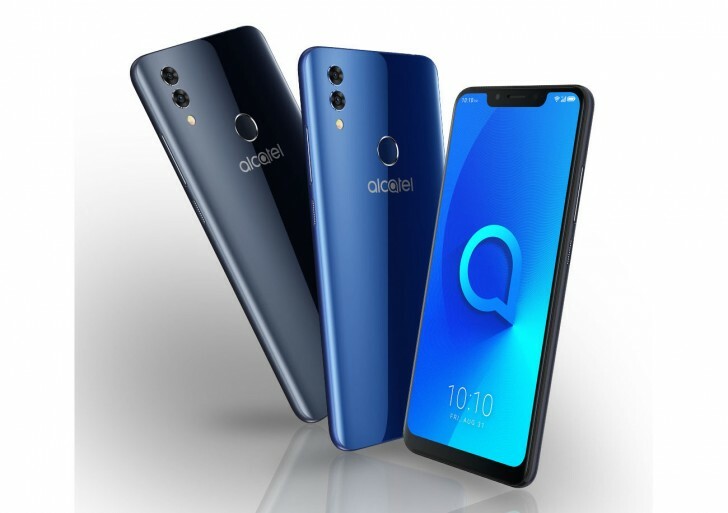 TCL-owned alcatel has unveiled its newest flagship offering today, the 5V. The phone comes with a 6.2-inch 19:9 notched display with 720x1500 resolution, an 88% screen-to-body ratio, and 2.5D Dragontrail glass on top. The alcatel 5V has a dual 12 MP + 2 MP rear camera system with dual-tone LED flash, with the secondary sensor being used only for depth information, enabling bokeh effects. The main snapper has 1.25μm pixels and 1/2.8" size, and the camera software can do things like AI scene detection, burst shot, HDR, real-time bokeh, and it also contains electronic image stabilization and Google Lens (which tries to identify the things you're pointing the camera at). The selfie shooter is an 8 MP unit with 1.12μm pixels and 1/4" sensor size. Of course you get stuff such as face beautification, real-time photo and video filters, and even something called Social Mode (with Instant Collage, Photo Booth, and Easy Share). The handset is powered by MediaTek's Helio P22, also known as MT6762, which has a 2 GHz octa-core Cortex-A53 CPU. This is paired with 3GB of RAM and 32GB of expandable storage, and the whole thing is kept running by a 4,000 mAh battery. The alcatel 5V will be offered in blue and black and runs Android 8.1 Oreo. Its dimensions are 153.7 x 74.55 x 8.5 mm, and it weighs 158g. It will become available in "select markets" later this month at prices starting from $199.99.